As I do most summers, I’ve spent a bit of time reading next year’s Bluebonnet nominees and so far, I’ve not found what I think is a clear favorite. I’ve found some that I really don’t love and some that I can’t fathom why they’ve been included on the list. 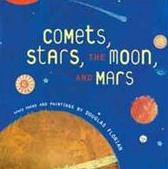 So far, one of my favorites (because I’m a geeky teacher at heart) is Douglas Florian’s poetry collection, Comets, Stars, the Moon and Mars: Space Poems and Paintings. I’ve loved his past work and so do so many of my students. His poetry is accessible to even the most stalwart of non-poetry-reading boys, and I love it that he is also an artist. This collection fits perfectly into the curriculum, has intriguing artwork, humor and information all at once. Pluto is even treated scientifically correctly! That being said, I know that some kids will like this a lot, but it will be mostly teachers that love it and find curricular uses for it. I wonder… Two more nominees that I loved reading (with minor questions) are Cherise Harper’s Just Grace and MJ Auch’s One-Handed Catch. LOVED them both for read-alouds. Just Grace will be accessible to many of my 3rd graders, where most of the books on this list this year may be a tad too challenging for them. I wished at the end of that book that Harper had found some way to resolve her plot without having the 2 children lie to their neighbor and get away with it. I had to groan a tiny bit on that note. To persnickety of me? Am I turning into a pinched librarian? One-Handed Catch is just wonderful–and it made me want to look into having Mary Jane and Herm Auch for an author visit! This fictional account, loosely based upon a year in Herm’s childhood, is funny and touching and just has so many good jumping off places for class discussion/writing. I’d love to read this to a class. I wish Auch had left the part out about Santa not being real though…even 5th graders still want to believe! Dang! Loved, loved LOVED it though!